For UNDER 21 guests, the open bar is limited to NON-ALCOHOLIC beverages. Strollers must be checked upon arrival and are not permitted within the attraction. Coat Check (provided by and responsibility of venue - additional charge). Please enter event at 41st St and 8th Ave (North) between 7:00PM-11:30PM and 12:15AM-2:00AM (as regulated by NYPD.) Admittance restrictions may be in place during the Ball Drop (11:30PM - 12:15AM.) Regardless of admittance time to your party, make sure to enter the Times Square area no later than 8pm. This is a unique, one of a kind ticket. There are a limited number of tickets available and the PRICE IS PER PERSON. This is roped off area that looks out onto 42nd Street from the West Side of the ball drop. You will have a direct view of the Live Ball Drop from the Side of the ball. The viewing area is located on the second floor of Madame Tussaud’s. This is a unique, once in a lifetime experience. Note: There are a limited number of tickets available. All ticket holders are required to submit a Credit Card Authorization Form. Within 72 hrs of placing your order, you will receive an email to complete the authorization. PRICE IS PER PERSON and a limited number of tickets available. This is a roped off area that looks out onto 42nd Street from the West Side of the ball drop. You will have a direct view of the Live Ball Drop from the Side of the ball. The viewing area is located on the second floor of Madame Tussaud’s and separate area from the Main Party. All general admission ticket benefits (including open bar (7pm-12am). 3 Hour Passed Food (7pm-10pm). ​Seating is available for groups of 4 or more. Depending on your final group size, you may be required to share with similar ticket holders. All ticket holders are required to submit a Credit Card Authorization Form. Within 24 hrs of placing your order, you will receive an email to complete the authorization. This New Year’s Eve, dare to be bold and party with your favorite celebrities at renowned Madam Tussauds in Times Square, New York City. Madam Tussauds, home of lifelike wax replicas depicting the world’s most rich and famous, invites you to a “surreal” and supercharged party this NYE that will satisfy revelers of all ages. Keep company with Lady Gaga, Leonardo DiCaprio, Oprah Winfrey and NYC’s hot partiers as you indulge in all the greatest party amenities NYC has to offer. On New Year’s night, NYC Times Square’s Madam Tussauds wax museum emporium transforms into a nightclub that’s truly out of this world. 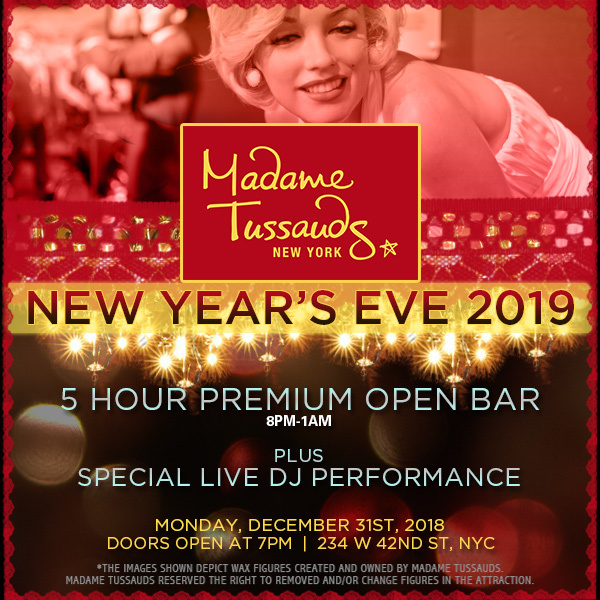 A stone’s throw from the New Year’s ball drop in Times Square, this multilevel gallery will amaze you with more than 200 true-to-life wax figures, not to mention a 5 hour open bar that will fuel the party all night. Stroll through the maze of showrooms and enjoy the exhibits before the white-hot beats of Top 40, Hip Hop, House, and Dance by a special live DJ entices you to the dance floor. Complimentary goodies help light up the party as you sample delightful early evening bites. When the magic moment arrives, the entire crowd will join in an exhilarating live count down, complete with a complimentary champagne toast. But for the extreme Ball Drop fan, Madam Tussouds is offering Viewing Gallery passes that gives you access to an exclusive, secured second floor area offering prime views of the New Year’s Waterford crystal Ball Drop just beyond the full wall window. It’s so close, you can almost touch it. Other VIP options are also available with reserved seating and bottle service. Get set for an immersive curiosity and, for one night, nightclub experience at Times Square’s Madame Tussauds that is so titillating it will astound you. Once you’ve stepped through the entrance doors hyper realistic wax figures of A-list Hollywood royalty, pop stars, and major league athletes greet you. Enter this multi-level curio-museum – bringing 200 years of history in Europe to complete the wonder of Times Square – you’ll step into a dream with all your favorite icons or jump into the time machine to visit the past and ring in the new with Frank Sinatra, Michael Jackson and Marilyn Monroe. This New Year’s Eve, a world of wonder awaits you at Madame Tussauds, steps away from the Times Square Ball Drop. Blending fantastic entertainment and the hottest party amenities, Madame Tussauds deliver a truly extraordinary NYE experience that must be seen to be believed.